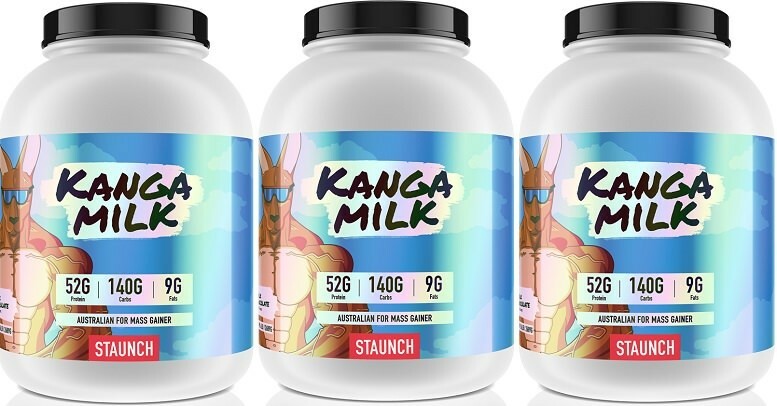 Kanga Milk has got to be the wildest name we’ve ever seen in a mass gainer supplement… But it’s actually quite fantastic and entertaining, coming from Australian Native Calum Von Moger’s own Staunch Nation. Names aside though, is Kanga Milk a quality mass gainer? Though, we don’t take it quite the same way as everyone else, and we’ll explain that farther down. Kanga Milk Quick Review: Staunch Nation’s Kanga Milk provides 12 servings of rich milk chocolate delivering 52 grams of protein and 840 total calories. That’s huge, and blows away virtually every competitor unless you prefer the grass-fed primo stuff. Not to mention, we got a free shaker cup when we ordered direct from Staunch. While reviewing Kanga Milk, we tried with water, whole milk, and coconut milk each individually. Each one was fantastic in their own respects compared to many of the mass gainers we’ve tried over the years. Consistency wise, Kanga Milk mixes very efficiently in water and milk. Good enough that you can cup and spoon stir it successfully. Though, with coconut milk we found that a shaker cup is the absolute best option. Likewise, using a shaker cup helps for the others if you are taking the full 2 scoop serving. Each serving of Kanga Milk provides 52 grams of protein. This can easily be increased by taking your Kanga Milk with actual dairy milk. 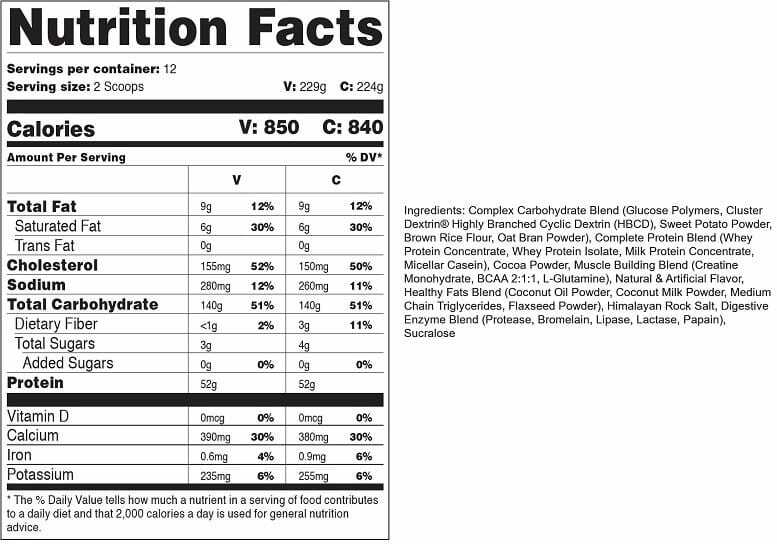 Overall, this is a great macro, and is large enough that you can half-serving Kanga Milk while still getting a good protein dosage (thus extending servings from 12 to 24). In each serving, you’re getting 140 grams of carbs. Yes, one hundred and forty grams! This will put meat on even the most Sméagol-like (http://lotr.wikia.com/wiki/Gollum) kid you’ve ever seen. At 840 calories per serving, Kanga Milk is a feast in its own respect. When you factor in all the respect your gains will also get you… Well, the world is yours. On every metric, Kanga Milk exceeds all expectations. After all, let’s face it… Mass gainers generally taste like trash and are mad expensive. Kanga Milk on the other-hard tastes like chocolate milk and is just $50. Less, if you factor in site-direct quantity discounts. For that reason, we give Kanga the 10/10 perfect as a Mass Gainer. If you look deeper into the “other ingredients” section, you will find that Kanga Milk also contains creatine monohydrate and BCAAs! While reviewing Kanga Milk, we experimented with it in a variety of ways. We took Kanga Milk with: water, milk, coconut milk. All the mains. Each method held up great. As one scoop (26 grams protein, 70 grams carbs), with milk (extra 7 grams protein, 15 grams carbs), and as a side to a real food meal. This would net approximately 33 grams of protein and 85 grams of carbs from the mass gainer, which is in addition to real food that contains more protein, more carbs, and a bit of fiber-rich vegetable nutrition. By doing this, we extended the servings of each Kanga Milk tub from 12-24, while ensuring that well-rounded nutrition was met. frequently, while keeping calories high, which meant more weight. We really enjoyed reviewing Kanga Milk, just like we enjoyed reviewing several other Staunch Nation products (to the extent of our review budget). If you decide to get Kanga Milk, we recommend stocking up in order to get a quantity discount. One tub on its own is $50, but if you increase quantity to 3 tubs, the price reduces to about $44 per tub which is like a free serving for each. Regardless, we rate Staunch Nation highly as a brand, and hope you enjoyed this review.